Ouimet Canyon is a large gorge located in Dorion, Ontario. The gorge is 100 metres deep, 150 metres wide and 2 km long. The canyon is so deep and cold that three species of Arctic plants flourish there. Ouimet Canyon Provincial Park protects an area of 7.77 square kilometres (3.00 sq mi) around the canyon. This is a day-use park so there are no camping facilities. The picnic areas located near the parking area and toilets are available. The park is open from mid-May until mid-October. The ‘Indian Head’ is a another feature of the canyon. It is a large rock column that can be seen from the second viewing platform. The Indian Head has a legend associated with it. A long time ago, there was a giant named Omett. He helped Nanabijou make mountains and lakes. Omett fell in love with Nanabijou’s daughter Naiomi. One day, Omett was moving a mountain when part of it fell off and killed Naiomi. Omett quickly hid Naiomi. Nanabijou desperately looked for his daughter. When he sensed something underground, he sent a thunderbolt to split open the ground which created a canyon and he discovered his daughter at its bottom. He buried her there and to punish Omett he turned him into stone and put him on the canyon walls to watch Naiomi’s grave forever. Hiking is limited in this provincial park since the valley bottom is closed to visitors because of the fragility of its plant life. There used to be several trails in the park but these days only one trail is maintained. 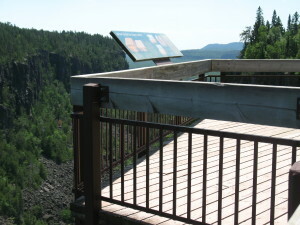 The accessible, 1 km loop trail leads to two viewing platforms overlooking the canyon. The platforms display interpretive panels that explain the unusual ecology. The trail runs well back from the canyon’s edge but children should still be restrained from wandering as there are no fences along the canyon edge and the forest goes right to the edge so it is hard to see where it is. There is a large wind farm currently being constructed nearby. It does not seem like you will be able to see or hear the wind farm from the park. At this point I’ve only covered four wheelchair accessible trails so far: Sweetheart’s Bluff, High Falls USA, Pigeon River Boardwalk and now Ouimet Canyon.